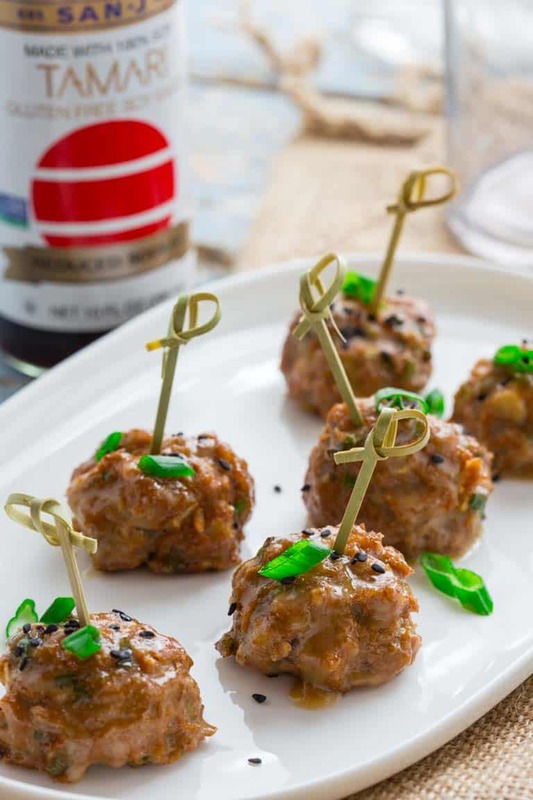 These festive party meatballs are a real crowd-pleaser! And almost everyone at the party can enjoy them because they’re naturally gluten-free! Ground lean turkey is mixed with San-J Reduced Sodium Tamari Soy Sauce and ginger. They’re baked until golden, and tossed with a sweet and creamy maple tahini glaze. I served them sprinkled with black sesame seeds and chopped scallions. This post is sponsored by San-J International, Inc. I was compensated for my time. All opinions expressed here are my own. Thank you for supporting the brands that make Healthy Seasonal Recipes possible. Alright you guys, I learned something really cool here and you have to forgive me for a second while I get all food science dorky on you for a moment. It’s about soy sauce! More specifically tamari soy sauce. There’s a difference between the two and it has to do with the ingredients. Regular soy sauce is made with soy beans, but it also has wheat. It’s usually made with somewhere between 40 to 60 percent wheat. If you had asked me, I would have guessed that there was only a trace of wheat, but 50% is a whole heck of a lot more than that! Who knew! San-J Tamari on the other hand is made with only soy beans resulting in a gluten-free soy sauce, and a much richer, more nuanced flavor. No wonder I always preferred the flavor! And it’s made without any artificial preservatives, flavors, or colors, and it’s Non-GMO! The folks at San-J sent me an information package and it kinda blew me down, because it had all the steps of making soy sauce explained. I have to say, it’s a little funky. Literally! 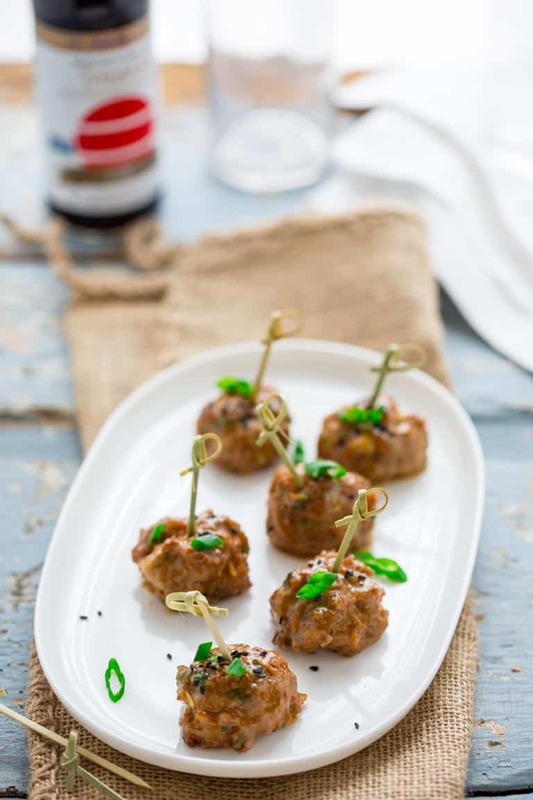 So if you’re not into this kind of thing, simply skip ahead to the awesome Tamari Turkey Meatballs with Maple Tahini Glaze. They’ll make a splash at your holiday party! First the soybeans are soaked and cooked in big steam cookers. Then they are formed into nuggets and mixed with “seed koji” this gets the fermentation process going. Next the nuggets are put into a Japanese incubation chamber called a Muro for 2 days where they get fuzzy yellow mold coating on them. Are you hungry yet? Then it just hangs out and brews for up to 6 months while the snazzy folks at San-J keep a watchful eye on it. The extracted product is Raw Tamari. Then it is pasteurized and filtered. All that amazing complex fermented/ brewed flavor was just the thing these little party meatballs needed. Since this is the season of parties and excesses, I thought sharing a tasty full-flavor (yet really lean and gluten-free) appetizer would be just the thing you were hoping to pop in your mouth. I had to test this several times, and it really does matter which turkey you buy. Please look for 99% lean. The other kinds- especially those that do not specify the amount of fat- do not work for this recipe. They fall apart and they have an odd mushy texture. I have not tested this with pork or beef, but my guess is that ground pork (with more fat) would be fabulous. I promise to come back and report if I do try it soon, and I’d love it if you did the same. If you have the regular San-J Tamari, not the reduced-sodium, simply omit the 2 teaspoons in the glaze to ensure the meatballs will not be over salted. I also tested this with ½ cup chopped drained water chestnuts added into the mixture of turkey and seasoning. They were really lovely, and added a great texture contrast. So if you want to go the extra mile, I highly recommend it. Did you know that regular soy sauce was made with half wheat and half soy? Did you know the difference between regular soy sauce and tamari soy sauce? Did you know that tamari soy sauce was fermented and brewed like that? 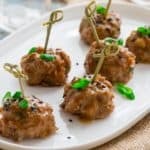 Please let me know if you make these party meatballs! I’d love to hear what you think. Ground lean turkey is mixed with San-J reduced sodium tamari and ginger. They’re baked until golden, and tossed with a sweet and creamy maple tahini glaze. They are naturally gluten-free. Whisk Tamari, sesame oil, ginger and red chili in a large bowl. Whisk in cornstarch until smooth. Stir in 2 minced scallions and water chestnuts. Stir in turkey until completely combined. Drop turkey mixture by rounded tablespoons onto the prepared baking sheet, gently re-shaping into ball shapes if necessary. Lightly coat the balls with cooking spray and transfer to the oven. Bake until the meat is cooked through, 17 to 20 minutes. Let sit for 3 minutes to firm up. Whisk maple syrup and tahini in a large bowl. Add the cooked meatballs and gently stir to coat. Transfer to a serving platter. 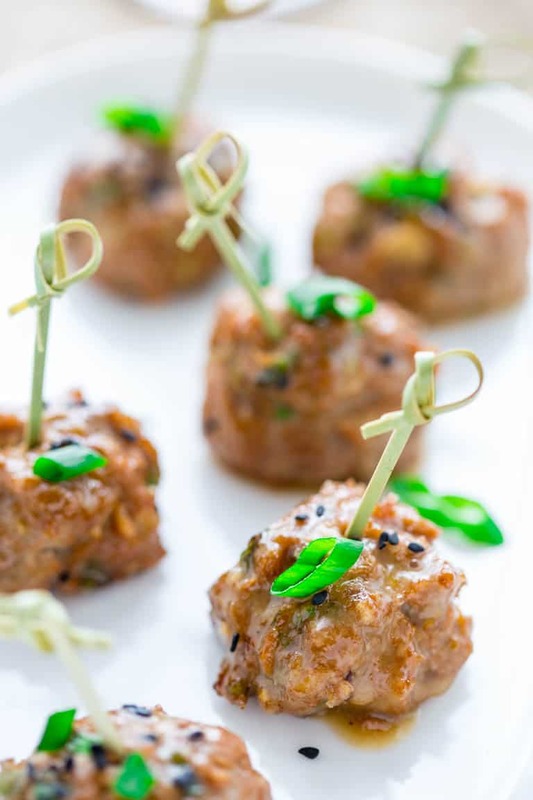 Sprinkle the meatballs with the remaining sliced scallions and sesame seeds and serve hot with toothpicks. These sound and look fantastic. Wouldn’t it be fun to have meatball party? I’ve seen so many yummy versions. I love your bamboo toothpicks. 🙂 And thank you for your explanation of soy sauce versus tamari. I have celiac disease and it is disheartening to see people post “gluten free” recipes containing soy sauce without specifying. Thank you for your educating in the blog. I bought those toothpicks forever ago because I thought, oh those would be cute to use for meatballs. And now I am finally making meatballs! ha ha. Glad you noticed/appreciated them. And about wheat in soy sauce, I totally feel for you. 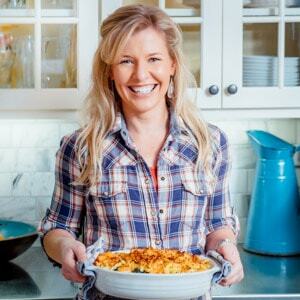 I used to personal chef for clients with celiac disease, so I know how hard educating about what is truly gluten-free can be. I distinctly remember calling ahead to a very fancy restaurant on behalf of one of my clients who would be dining there. I asked about extracts and cooking sprays for pans and they thought I was crazy. Soy sauce is a classic example! 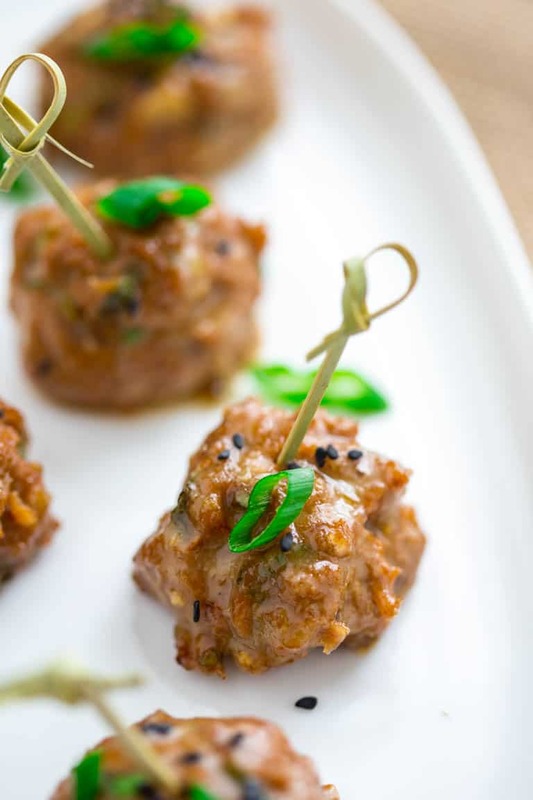 This meatball recipe looks delicious and it is wonderful idea to upcoming holiday party. This is awesome. This is a very nice recipe for parties. I like the added maple flavor, chili flakes, ginger and tahini. I did not know the difference between tamari and soy. Your explanation of the processing procedure was very interesting. Thanks so much and glad you stopped by today! Yum!!! 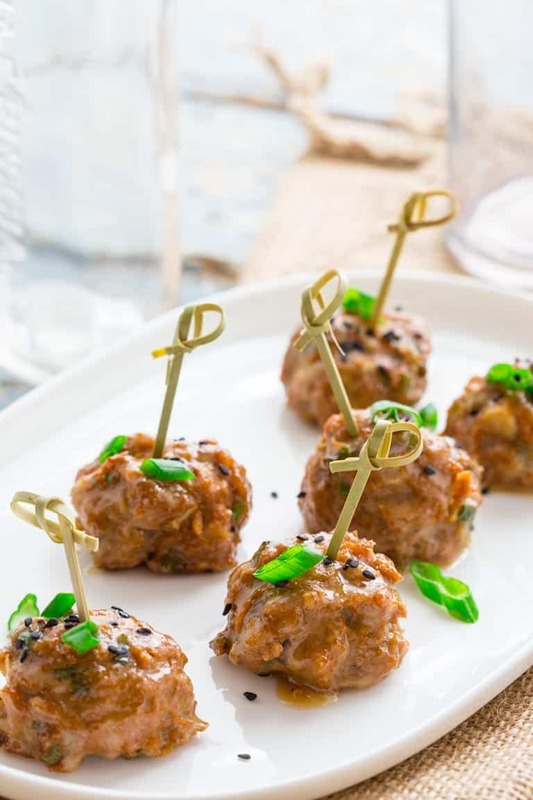 These would make for a perfect appetizer for the holidays or the next time I’m entertaining! Can’t wait to try it! Thank you so much Sarah! Hope you have a great day. I recently discovered tamari – I love the umami kick it gives to savory dishes! Pairing it with turkey meatballs is genius – I can’t wait to give this a try. That’s great Luci. Hope you have a great day. So glad to have found your site. 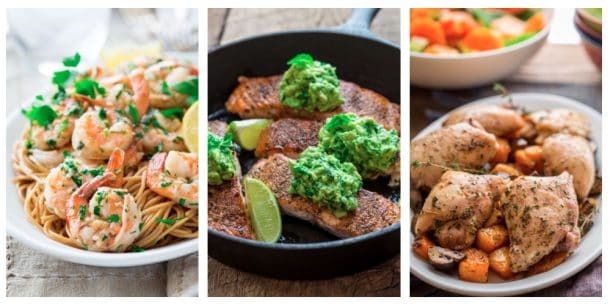 Wonderful, simple recipes. This one looks great and I am going to definitely print out and make it. I do have a question. I don’t see anywhere in the ingredients the water chestnuts listed. They are mentioned in the preparation part of the recipe. thank you. I am so glad you said somethingJeanne, because this recipe was still in an older format, and we must have missed it when moving it to the newer one. You’ll find the recipe updated complete with water chestnuts above. For the record, I tested with and without water chestnuts and it works both ways. They add a nice texture contrast and bulk up the meatballs a bit. But if you like to leave them out that is fine as well.